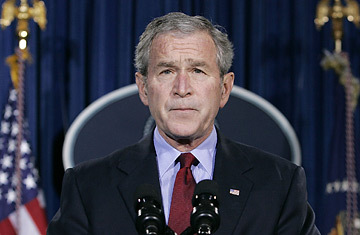 U.S. President George W. Bush speaks about the death of Pakistani opposition leader Benazir Bhutto at his ranch in Crawford, Texas, December 27, 2007. The weeks to come will determine just how severe a blow Benazir Bhutto's death is to Pakistan, but debate over Washington's role in the run up to this tragic day will continue well beyond that. Even as the smoke still lingered in Rawalpindi, President Bush demanded that those responsible for Bhutto's death be caught and punished. "The United States strongly condemns this cowardly act by murderous extremists who are trying to undermine Pakistan's democracy," Bush told reporters in Crawford, Texas, where he had arrived Wednesday to begin a long New Year's holiday. "Those who committed this crime must be brought to justice." But there are some who think the Bush Administration is not without blame. Hussain Haqqani, a former top aide to Bhutto and now a professor at Boston University, thinks the U.S., which has counted Pakistani President Pervez Musharraf as a key ally against terrorism since 9/11, bears some of the responsibility. "Washington will have to answer a lot of questions, especially the Administration," he says. "People like me have been making specific requests to American officials to intervene and ask for particular security arrangements be made for her, and they have been constantly just trusting the Musharraf Administration." U.S. officials said they were leery of intervening in another nation's internal affairs, and didn't want to give Bhutto Washington's imprimatur. Haqqani is not shy about pointing fingers. He blames Musharraf himself, above all, for Bhutto's death. "It's quite clear that Musharraf does not want an election  you can quote me  he is the one who has constantly wanted anybody who can threaten him or his power, out." Haqqani told Congress in October that U.S. aid for Pakistan has for too long been tilted toward the Pakistani military. "Since 1954 almost $21 billion had been given to Pakistan in aid," he told the House Armed Services Committee. "Of this, $17.7 billion were given under military rule, and only $3.4 billion was given to Pakistan and the civilian government." It is Musharraf's iron grip on power that has made Washington's own policy toward Pakistan such a target of criticism. While Washington has publicly extolled the virtues of democracy and hoped that Bhutto's return to Pakistan in October would usher in a power-sharing deal with Musharraf, it was also clearly nervous about the instability if the country's strong man were to lose power entirely. Pakistan  the world's second-most-populous Muslim nation, with elements of al-Qaeda and the Taliban controlling lawless mountainous pockets in the northwest  is also the only Islamic state with a nuclear arsenal. And though Washington publicly says Pakistan's nuclear weapons are safe, there are always private concerns about their security, concerns that will only heighten in the wake of Bhutto's assassination. The U.S. has few options in Pakistan. One thing is clear, says Peter Galbraith, senior fellow at the Center for Arms Control and Non-Proliferation: It is "not a good idea to have 70 nuclear weapons in the hands of a country that is falling apart." Some observers believe that U.S. policy in Pakistan has favored personalities over principles. "We have a bad habit of always personalizing our foreign policy," says P.J. Crowley, senior fellow at the Center for American Progress. "We've done it with Musharraf, and we did it with respect to Bhutto. We are very good at providing technical support to the Pakistani army. We are not good at building indigenous or effective local political processes or strong institutions of government." Given the realities on the ground, the U.S. is likely to continue to throw its support behind Musharraf. "In terms of political leadership, Pakistan does not have a deep bench," says Crowley. Some will say Bhutto had a death wish; one U.S. official even termed her presence at large-scale campaign rallies "foolhardy", given the Karachi suicide bombing that killed more than 140 people on October 18, the day she returned from exile. She returned to Pakistan and faced a range of powerful anti-democratic enemies, including both religious extremists like al-Qaeda and corrupt branches of the Pakistani military and intelligence services. "When you have the criminal and corrupt in the same camp it makes for dangerous bedfellows," says Arsalan Iftikhar, contributing editor to Islamica magazine. "In a sense Benazir knew she was on a martyrdom mission. She was willing to give up her life for democracy." Senator Joseph Biden, the Delaware Democratic and presidential candidate, echoed Haqqani's view that Musharraf, at a minimum, didn't provide Bhutto with adequate security. In fact, he twice urged the Pakistani President to bolster Bhutto's protection. "The failure to protect Ms. Bhutto raises a lot of hard questions for the government and security services that must be answered," said Biden, who is also chairman of the foreign relations committee. "The U.S. should offer any assistance necessary, including investigative teams, to get to the bottom of this horror." Still, the former top U.S. military commander in that part of the world said it's wrong to blame Musharraf, or the U.S. "I think it is al-Qaeda  they're the only ones who gain from this," says Anthony Zinni, a retired four-star Marine general who served as chief of the U.S. Central Command  responsible for Pakistan  from 1997 to 2000. Zinni rattled off reasons for al-Qaeda's wanting Bhutto dead, including her commitment to democracy, her secular views, the blowback it will create for Musharraf, and her gender. Beyond that, Zinni says al-Qaeda  making marginal progress in Afghanistan, backsliding in Iraq, and rebuffed in Somalia  is looking for a new battlefield. "I really think they're trying to ignite Pakistan into the kind of chaos they need to survive," Zinni says, "and create a fundamentalist, even radical, Islamic government." "This is one of the worst things that could happen to Musharraf," he continues. "In part, because he'll be accused of doing it." Zinni also disputes the idea that Washington could have done anything to prevent the assassination. "You want Blackwater out there providing security for her?" he asked, referring to the controversial U.S. private-security firm implicated in the deaths of many Iraqi civilians. "The losing of Pakistan  to whatever degree we've lost it, and I wouldn't write it off yet  goes back to after the first Afghan war," Zinni says, when Washington neglected the Afghan-Pakistan border roiling with insurgents. "We put them in a bad situation that we helped create," Zinni says. "I'm no fan of this Administration, but you can't criticize this Administration for what they inherited."